For the second time this weekend at Dover International Speedway, Kyle Busch finds himself in victory lane, as he adds to last night’s NASCAR Camping World Truck Series (NCWTS) win with victory in Saturday’s NASCAR Nationwide Series (NNS) Buckle Up 200. Busch, who led the most laps – 124 out of 200, received his third series win of the 2014 season, his thirty-third series career win and his fourth series win at Dover International Speedway. Busch also became the first driver to win both NCWTS & NNS races in the same weekend at Dover International Speedway, and is the only driver to win all three NASCAR national series in one weekend – Bristol 2010. Trevor Bayne came up short by 1.005 seconds to finish second, and he was followed by pole-sitter Joey Logano finishing third, Matt Kenseth fourth and series Sunoco Rookie of the Year (ROTY) candidate, Chase Elliott finished fifth. Rounding out the top-ten finishing positions were Kyle Larson bringing home sixth, Brian Scott seventh, ROTY candidate Ty Dillon eighth, Elliott Sadler ninth and the current series points leader, Regan Smith taking tenth-place. With points leader Regan Smith finishing a place behind Elliott Sadler (second in points) Regan leaves Dover win a 4-point lead over Sadler in the standings. Time of Race: 01 Hrs, 44 Mins, 35 Secs. Next Up: The team have the next weekend off and return to action at Michigan International Speedway on Saturday, June 14th, with an approximate start of the 250 mile race at 2:20 p.m. (ET). Television coverage of the event will be provided by ESPN beginning with their 1:30 p.m. (ET) NASCAR Countdown pre-race show. Coors Light Pole winner Joey Logano will lead the Buckle Up 200 field to green. Late Saturday morning at Dover International Speedway, Joey Logano, with a qualifying lap speed of 155.474 m.p.h., captured the 2014 NASCAR Nationwide Series (NNS) Buckle Up 200 Coors Light Pole Award. Sharing the front row with Logano to start second with qualifying lap speed of 155.119 m.p.h., will be series Sunoco Rookie of the Year (ROTY) contender, Chase Elliott. Following Logano and Elliott to the drop of the green flag will be Brian Scott (154.799 m.p.h.) starting third, Kyle Busch (154.606) fourth and Trevor Bayne (154.341) will start from fifth. Rounding out the top-ten starting positions will be Matt Kenseth (154.275 m.p.h.) starting sixth, Kyle Larson (154.096) seventh, ROTY contender Chris Buescher (153.899) eighth, Elliott Sadler (153.833) ninth and Brendan Gaughan (153.257) starts tenth. The 33rd annual Buckle Up 200 is slated to get started around 2:50 p.m. (ET) this afternoon, and ESPN will begin their television coverage with their 2:00 .p.m. (ET) NASCAR Countdown pre-race show. It was NASCAR Nationwide Series (NNS) Sunoco Rookie of the Year (ROTY) candidate, Chase Elliott, with a lap speed of 154.692 m.p.h., at the top of the speed chart – as he was this morning – during the final Buckle Up 200 practice session at Dover International Speedway. Brian Scott was second fastest with a lap speed of 154.606 m.p.h., and he was followed by Trevor Bayne (154.381 m.p.h.) who was third, Joey Logano (154.248) fourth and Kyle Busch (153.984) was fifth. Rounding out the top-ten fastest drivers in the “Happy Hour” (final) session were Matt Kenseth (153.492 m.p.h.) who was sixth, Kyle Larson (153.427) seventh, Brendan Gaughan and Ty Dillon (with the identical lap speed of 152.633 m.p.h.) were eighth and ninth respectively and Elliott Sadler (152.620) was tenth. The teams will return to the track Saturday mornig at 10:40 a.m. (ET) for qualifying to determine the starting lineup for that afternoon’s race. The 33rd annual Buckle Up 200 is slated to get started around 2:50 p.m. (ET) Saturday afternoon, and ESPN will begin their television coverage with their 2:00 .p.m. (ET) NASCAR Countdown pre-race show. NASCAR Nationwide Series (NNS) Sunoco Rookie of the Year (ROTY) candidate, Chase Elliott, with a lap speed of 157.618 m.p.h., was the fastest Friday morning during the first Buckle Up 200 practice session at Dover International Speedway. Second fastest in the session with a lap speed of 155.602 m.p.h. (ET) was Cale Conley, followed by ROTY candidates Ty Dillon (155.521 m.p.h.) and Chris Buescher (155.233) who were third and fourth fastest repsectively, and Joey Logano (155.132) was fifth. Rounding out the top-ten fastest drivers in the session were Kyle Larson (154.852 m.p.h.) who was sixth, Brian Scott (154.679) seventh, Elliott Sadler (154.666) eighth, Regan Smith (154.248) ninth and Trevor Bayne (153.998) posting tenth. The teams will return to the track later this afternoon for their “Happy Hour” (final) practice that is schedule to run from 2:00 p.m. – 3:20 p.m. (ET) before returning on Saturday at 10:40 a.m. (ET) for qualifying. Notes: While teams in all three NASCAR series will run the same right-side tire code (D-4440) at Dover this week, those in Nationwide and Camping World Truck will run a different left-side code (D-4614) than those in Sprint Cup . . . in Nationwide and Truck, this is the same right-side tire that has been run at Dover since 2012 . . . this is the first race weekend for this left-side tire . . . Goodyear held a test with teams from all three NASCAR series at Dover on May 6-7 . . . Nationwide drivers Ty Dillon (No. 3 Richard Childress Racing Chevrolet) and Elliott Sadler (No. 11 Joe Gibbs Racing Toyota) participated in the test, as did Camping World Truck drivers Ryan Blaney (No. 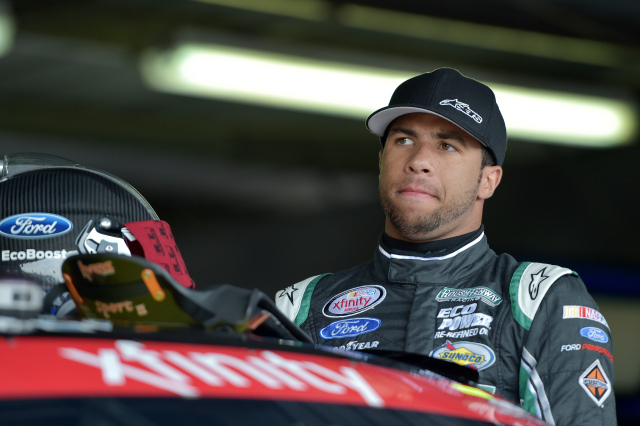 29 Brad Keselowski Racing Ford) and Darrell Wallace Jr. (No. 54 Kyle Busch Motorsports Toyota) . . . Sprint Cup drivers Kyle Busch, Martin Truex Jr., and Carl Edwards also took part in the test. . . Dover is unique among NASCAR ovals one mile or less in length, in that inner liners are required in all four tire positions . . . air pressure in those inner liners should be 12-25 psi greater than that of the outer tire.